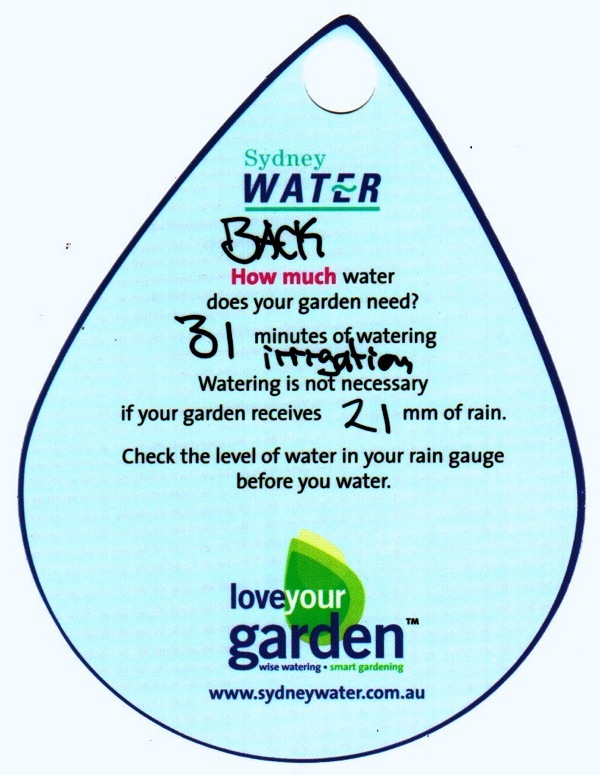 Yesterday we had our Sydney Water “Love Your Garden” session. For $33, a qualified horticulturalist comes and inspects your garden and gives you advice on its watering needs. Our horticulturalist (let’s call her Linda) arrived bang on time. She was very friendly and knowledgeable, and understood right away where we were coming from. I explained about Sustainable Illawarra and what we were trying to achieve. Actually, she was really impressed with Kiama Council when I told her about the compost workshop last weekend, the free compost bin for participants, the subsidised bokashi buckets we can get, etc. First, we walked around our property and I explained what we were doing or planned to do in each area. Mostly it involved planting food plants everywhere. Linda had some good suggestions for different plants to consider in different areas, and advised that we generally plant the smaller plants and shrubs towards the front of our front yard (north), and use larger shrubs and trees going further uphill and towards the back (south). This maximises the sun each plant receives, and makes sure the larger plants don’t shade smaller plants behind them. Linda had a really good understanding of organic gardening and permaculture, and gave me lots of little tips on various plants as we walked around (the clivias are getting too much sun, throw banana skins into the bird’s nest ferns, the beans would benefit from some fish emulsion on their leaves, etc). She also showed me a few different bugs in the vegie patch – good ones and bad ones. Next Linda did a “dog poo” test of our soil in various places. This involved squeezing a handful of soil into a ball, and trying to roll it into a sausage (or dog poo). Our natural soil, which is mostly in the front yard and down the side of the house, held together in a sausage, and is mostly clay. Linda called it a loamy clay, being mostly clay with some organic matter. She advised that we try to get more organic matter into the soil, to turn it into a clay loam. The best way to lighten it is to dig in compost and cow manure when preparing new beds, and keep a good mulch of sugar cane or lucerne in all the beds. Besides retaining moisture in the soil, worms will feed on the mulch as it breaks down and move it deeper into the ground, breaking up the clay and spreading the organic matter throughout. Looking at the digging I’ve been doing in the front yard preparing for a retaining wall, we could see very obviously where the topsoil ended and the clay subsoil began. Linda said to make sure when we do the earthmoving to level the yard that the bobcat driver scrapes all the topsoil off to the side, then does the earthmoving, and then spreads the topsoil back on top. If we don’t do that, we’re going to have a hell of a time getting lawn and gardens to grow. The soil in our raised beds was bought from landscape suppliers. I knew at the time it wasn’t the best soil in the world, but Linda confirmed that. 🙂 When rolled into a sausage, it breaks up and doesn’t hold together. It also feels quite gritty between your fingers. She called it a loamy sand. Again, organic matter will improve it. Again, dig in compost and cow manure, and mulch heavily. We’ve been doing that, but it will take time to improve the soil and turn it into a sandy loam. The biggest problem with the vegie soil right now is that it drains fairly quickly and doesn’t hold moisture – more organic matter will help a lot with that. The good news was that there were already lots of worms in the soil working away, so all we really need to do is keep feeding them and things will improve over time. She also recommended we use the chickens’ bedding sawdust (full of lovely chook poo) directly spread around the vegie patch each time we change it. Linda was intrigued by our “square foot gardening” vegie patch. She’d never seen anything like it before, but seemed to think it was interesting when I explained it to her. I’ll write another post on that soon. She also hadn’t seen wicking boxes before, and was surprised that the tomatoes we have in them are doing so well. They’re very water-efficient, and I’ll write about them soon too. I was also able to pick Linda’s brain about greywater. 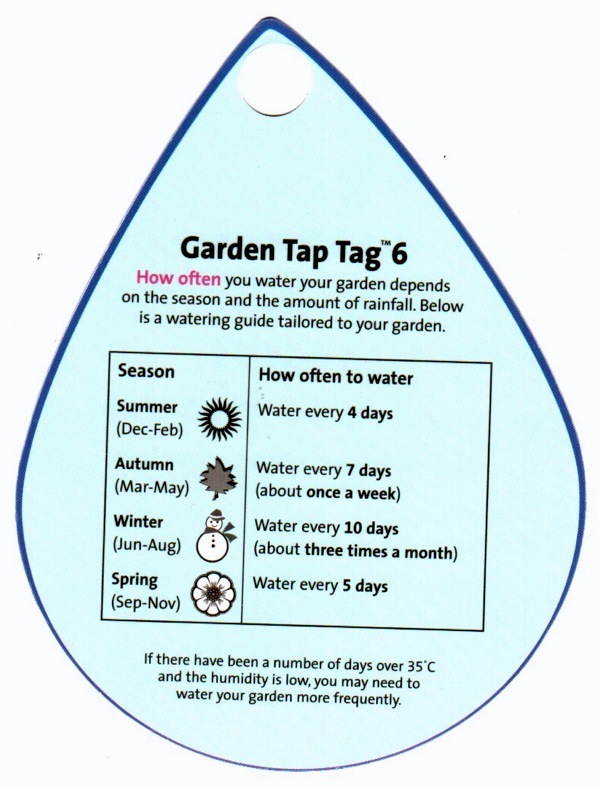 We can get a hose and start using the laundry rinsewater right now, using it to water the side garden. Using the shower/bath water from the main bathroom would be a bit more work, but our plans for citrus and other fruit trees would work well with the greywater. We’d need to plumb into the bathtub drain, and mount a surge tank under the bathroom that feeds a leaky hose running under the mulch around the fruit trees. Rainwater tanks are something else we’re interested in. Linda agreed that the large under-house bladder tanks we’ve been looking at would be a pretty good solution, given our lack of space around the house. It would probably only pick up about half the roof area, though, so she recommended we consider slimline tanks down either side of the house to pick up the remaining down pipes. They could be gravity drained to water the front yard, removing the cost and hassle of pumps. Before leaving, Linda gave me some tap tags (see images below, click for larger view). 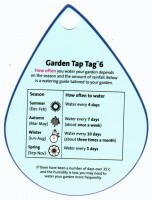 The idea is to cable-tie these to your taps, and they advise you on how much water your various garden beds need. She also gave me a rain gauge, so we can measure whether we’ve had enough rain and can skip a water. Obviously running a hose for a measured period of time only works if you know the flow rate of that tap, so she also gave me 15 L/min flow restrictors for each of the four garden taps. She also left me some brochures and information sheets on greywater use, rainwater tanks, and recommended plants for different types of gardens. A written report will be coming in the mail in a few weeks today. At the end of the day, the Love Your Garden service was well worth the money. An hour and a half with a qualified horticulturalist in your own garden for $33 is very good value. Just the tap flow restrictors and rain gauge are probably worth that! Although there weren’t any real eye-openers from the session, I got lots of little tidbits of great advice and ideas from Linda, and it was reassuring to know we’re heading down the right track. Great to meet you this evening. Really like your blog. You will have to post some pictures of your garden up here to show what you have been doing. You may have alreay since i have forgotten to bring my glasses up stairs i can hardly see this computer screen. Thanks Donna! It was nice to meet up. Hopefully I’ll get some photos posted soon – gotta get some time to sort them all out :-). Fantastic to hear you got so much out of this consultation Darren – we always wondered how these sessions were. It’s so great to here the consultant had an organic gardening and permaculture background, that’s just so critical for anyone in that kind of role! 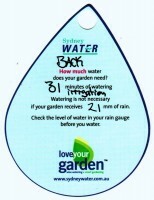 Often organisations into water conservation can simply advocate to plant gardens that don’t need watering at all, but investing some water in fruit trees and veggies has a HUGE net water saving, given the incredible amounts of water that go into producing food people buy from the supermarket. Growing food on a small scale is just so much more sustainable on so many levels! Great to hear you got some helpful tips on improving the soil too – the soil is our biggest water tank! Green manure crops are amount fantastic soil improving technique which might be helpful. We look forward to hearing more about how your garden is evolving! Thanks Rich and Ally! I’d always wondered what these consultations were like too, so we figured why not just do it and see. Hopefully after reading our description some other Challengers will also take up the offer. Yes, home-grown vegies are way more water-efficient than broadscale agriculture. It makes you wonder why Sydney Water now allows us to wash vehicles and hose windows any day of the week, but they still restrict the watering of vegie gardens. Seems dumb to me. Anyway, hopefully that’ll be a problem of the past soon, when we get some rainwater tanks installed.